MDR & MB didn't do their after dinner hilltop walk (just behind Philip's house) last night, got carried away watching episodes of Kenny on DVD. So today they went to a large reserve in Pukekohe which is cris-crossed with walking tracks. Today is another picture perfect day, again with just a hint of a cool breeze. 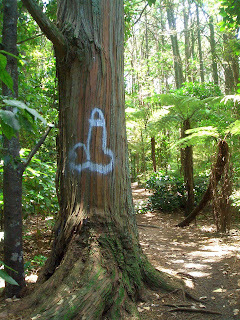 The reserve resembles a mini rainforest, filled with Totara trees and native palms, even found some indigenous art! Reminds MB of Summer Heights High. 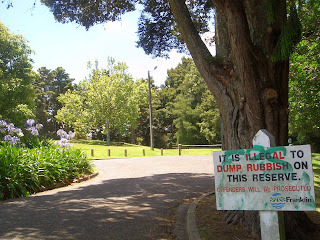 Graffiti appears to be a big problem in NZ, it's absolutely everywhere. MB even noticed some of the orange direction tags nailed to trees on the walking trail had been painted over with black spray paint.